Startup Iceland - Building a vibrant, sustainable and antifragile entrepreneurial ecosystem in Iceland - Do we need to look back before we succeed forwards? I don’t make any new year’s resolutions. As I was sitting with my family last evening, enjoying a quiet evening after having eaten my fill of turkey, stuffing, deserts and candy and I couldn’t help but reflect a bit on the past. 10 years ago, people didn’t spend most of their time in their mobile phones, but as I looked around me, half of my family was playing in a mobile phone or a tablet. (In Seoul the percentage is higher.. but that’s a story for a different day). 8 years ago, all the cool kids had a MySpace account. 5 years ago, people still sent SMS’s to each other on new years eve wishing their friends a happy new year. Friendster had come and gone. People had replaced MySpace with Facebook as their social media platform of choice. Today we send a Facebook post, Snapchat message or a Tweet from our smartphones to wish everyone a happy new year and usually include a “selfie”. If I visit myself 10 years ago (back when I was 21) and think about how I envisioned the future, I imagined flying cars, space travel being a commodity, hoverboards (like in Back To The Future 2) and stellar travel between solar systems among other things. I, of course, imagined a lot of other things as well that aren’t close to reality such as land line telephones being obsolete, private space ships, colonization on other planets, extra terrestrials being common on earth (similar to what was envisioned in Star Trek) and other non-sense. Unfortunately, we haven’t come quite as far as I imagined in my vision as a race. We still have a lot left to discover, invent and create. That means that the opportunities are still up for grabs, so if you want your future vision to come true then you have the opportunity to see it through. It’s very common for people to set a new year’s resolution for themselves in this bliss of stuffed bellies and cakes, mainly to get rid of the extra weight they worked so hard to put on during the holidays. People get grand visions of how they’re finally going to get rid of that stubborn belly fat, showing off those ripped six pack abs and those mean pecks. I personally wouldn’t mind having a body like in the image below.. but I’m not going to get it by only setting a resolution. Similarly, you may set a resolution to finally get that promotion, get a better job, succeed in your business or finally find that illustrious life partner. But New Year’s Resolutions are a SCAM! That’s right .. but it’s not a scam from the gyms or supermarkets .. it’s a scam made by yourself. The scam isn’t that you won’t be able to reach your goal, the scam is that you manage to convince yourself that all you need to ..
get that hot body by purchasing the annual plan to the gym ..
get that promotion by just thinking you deserve it ..
get that better job you’ve been dreaming about ..
succeed in your business by purchasing another super-software that does everything for you ..
find that life partner by joining a dating website or hang out in a pub ..
.. but not to Do The Work needed to see the results you want. I believe the underlying problem is that we (people in the western world?) have conditioned ourselves to not follow through on any new year’s resolutions. We created a habit to make a promise and then break it.. I don’t know about you, but I don’t like breaking promises, even the ones I make to myself. A friend of mine posted a status on Facebook between Christmas and new year’s eve that his new year’s resolution was to get in shape on the new year. I asked him why not call it a resolution (skip the new year’s part) and start today? 10 minutes later he posted a picture of himself walking outside in the snow. He hasn’t broken his promise to himself. I hope he keeps it up and sees his vision come through. Don’t set a New Year’s resolution, it’s much better to set a vision for your next year (or any other time period), with concrete goals and “checkpoints” (milestones) in your calendar. 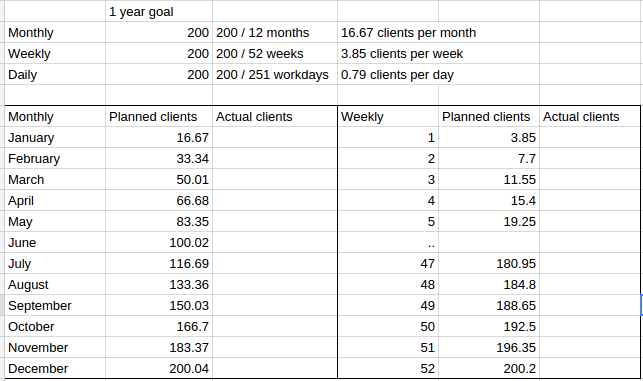 You might say “By January 2016 I will have 200 new clients”. Then you create weekly and monthly goals in your calendar from that. So then, every month you’ll have a calendar event to fill in your actual new client number and compare it to your estimations. Notice that I didn’t limit the client acquisition to any type of ads, platform or strategy .. you’ll have to pick what works for you, constantly assess if the method is working or not and change accordingly. You should be focused on the goals, not the methods. Here’s where the magic kicks in.. if you create a plan like this and force yourself to remember it every now and then, you’ll see if you’re on your goal path or if you need to revise the plan according to reality. You can use this same simple vision+milestone plan for revenue, weight loss or any other metric you want. Just remember to keep it simple and pick one or two metrics. But this only works if you keep at it, Do The Work and don’t lie to yourself. Setting visions isn’t a magic bullet .. you may not see your vision come true for a number of reasons. It is all too common to hear people take external facts and then add their own negative opinions to those facts as reasons for not being able to Do The Work. Sure, the economy may have collapsed. That is a fact. People may spend less annually in your market. That is a fact. It is your opinion that they don’t want to spend money. Most people want to spend money, but the reason to spend it must be a better reason than not spending it. If the economy is down, make sure that what you’re selling makes you more dollars than you spend on it. Alternatively, target the people spending money and up your marketing game. There are plenty of people and businesses willing to spend money. It’s your job to create something they need and sell it to them (or go work for someone who does). Procrastinating beyond recovery is something we seem to do for most goals. It’s very easy and common to think that you’ll make whatever’s lacking up later this year rather than doing something about it right now. Unfortunately I tend to do this too much. I don’t know where this originates, but I made this a habit in school. I simply didn’t need to do the work because it could be done in 2 minutes .. either while the teacher was talking or 2 minutes before class. My grades didn’t suffer (mostly) and I own a recognition from the President of Iceland for my excellence in school. I believe that Rakel at Skema / ReKode should be asked to implement her philosophy in the education system so it favors everyone, not just the average. That would keep the procrastination training at a minimum and education results at an all-time high. Becoming paralyzed because you don’t know what to do or who to ask is another common theme. The paralysis can be easily resolved by asking someone you respect and trust what they would do in your shoes, but due to the paralysis, you can’t ask anyone. I’ve had this happen to me, and the only thing I could do was to become an actor, act as if I was someone else and ask away. That way I managed to resolve my paralysis. “I’m going to be fit” – How fit? Have 10% bodyfat? “My company is going to be successful this year” – What is success to you? Number of clients? Amount of revenue? 10 dollars or 10 billion dollars? “I’m going to be healthy” – Again, what is healthy to you? Less than 5 half liter cokes per week? “We’re going to make it next month” – What is “making it”? Release an album? I modified the above visions a bit ..
Now, the first vision versions were impossible to reach since they didn’t have a measurable goal. Thus they would always be prone to fail. The second vision versions are much easier to measure, track and attain because they give you a single goal to focus on. When you’re setting your future visions, make sure they’re measurable and set revision milestones to that vision. Adjust the vision or the time needed accordingly. Do The Work! A car that doesn’t move won’t get to it’s destination any time soon. Just like the car, you won’t realize your goals unless you do the work!